As Fantasy Flight surprisingly announced in May, Star Wars X-Wing will soon enter a new era. In the third quarter of this year – more precisely in September 2018 – the 2nd edition (SWZ01) will be released and is already available for pre-order. The game has been on the market since 2012 and after 14 waves and 58 different spaceships, it was time for Fantasy Flight Games to take it to the next level. Of course, the basic principle of the game remains unchanged. Modifications are mainly about improving game flow and experience. The questions about why and how are answered by Fantasy Flight in their FAQ. A detailed overview of all known changes are all documented in-depth by diligent fans in this Google Doc. Of course, this doesn’t mean that you have to mothball your previous X-Wing collection right away. To ensure that the old ships can continue to be used, Fantasy Flight releases Conversion Kits with tokens, maneuver dials and the necessary cards to upgrade your collection. The introduction to the new edition is also gradual. Before the release of the new basic game in September, there are some little snacks, like the “Sowing Fear” expansion, to slowly introduce you to the new features. The TIE Reaper expansion comes with both components, for the First as well as for the Second Edition. This will give you a foretaste of what awaits you. You can use the Empire’s high-performance troop transport now already in your 1st Edition. At the same time you are equipped for the new era. The starfighter we know from Rogue One comes with cards and tokens for both editions as well as the renewed maneuver dial. And of course with a base in the new medium-size format. Certainly, we have also taken this generational shift into account with our foam tray for the TIE Reaper. The mat offers compartments for the maneuver dials with the larger diameter. And it has room for small bases as well as for the medium-size bases. 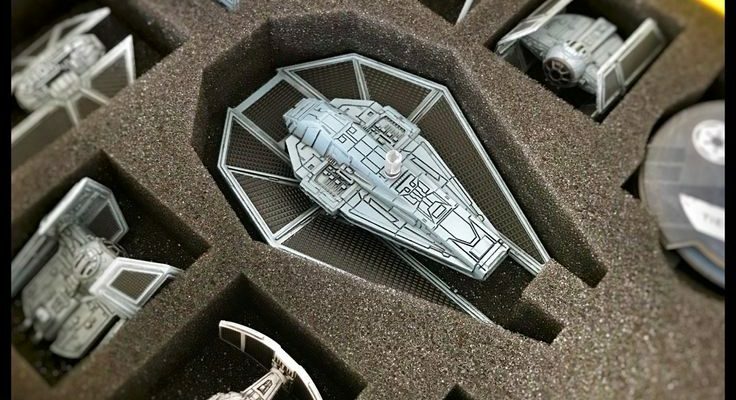 For those of you who already bed their 1st X-Wing edition ships in Feldherr foam, it may be good to know that the new maneuver dials also fit into the old mats. We originally designed the compartments so that the dials with the upgrades fit in. Since the new maneuver dials of the 2nd edition have the same diameter as the plastic discs of the upgrade kits, the new ones will fit into your old foam trays without any problems. And yes, we are working on a solution for the Conversion Kits containing the new medium-size bases and how these can be combined with the old mats. We will definitely keep you informed. If you have any suggestions or questions, please let us know. Via our Facebook page or by email to ideas@feldherr.org. 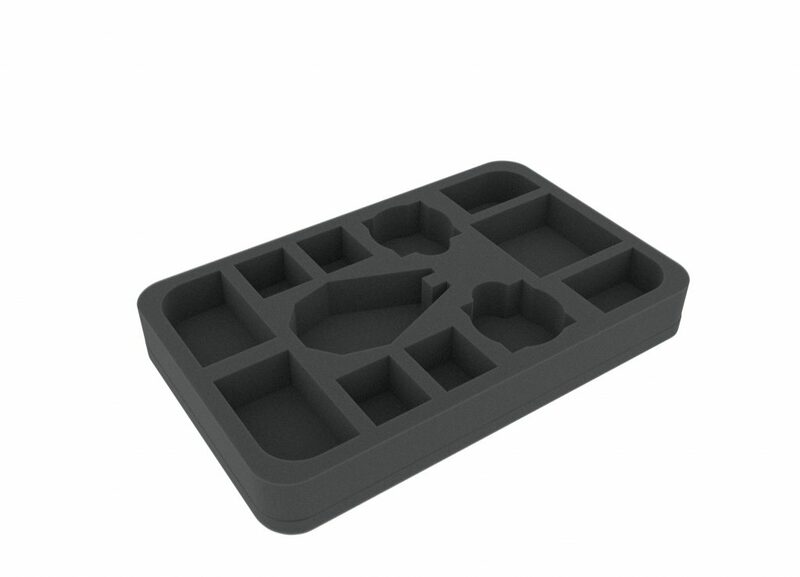 Here’s the foam tray for the TIE Reaper in the Feldherr Online-Shop. Also available in the practical magnetic box.